Refugee, migrant - two terms that are very politically charged, but how often do we think about the people behind these words? Sunjeev Sahota's The Year of the Runaways is fiction, but its subject is something that hits the headlines in the real world with alarming regularity, although with little of the nuance displayed in Sahota's novel. Tochi, Avtar and Randeep live in a cramped house in Sheffield. All are illegal immigrants from India, all spend their days working hard to make enough money to live, and all have very, very different stories, and reasons for seeking a better life in England. Born and brought up in London and seeking an escape of a different kind, Narinder finds her life tangled up with the three men in unexpected ways. The Year of the Runaways very quickly identifies itself as one of those books that is going to grab you by your heart and not let go until the last page. It's emotional, heartbreaking, and about the best and worst of humanity. The book moves between present day Sheffield and the backgrounds of its three male protagonists, so we see what brought them to the city. In the present day the men work their fingers to the bone, live in horrendous conditions, and always have the fear of being caught by the authorities hanging over them. That they choose the existence they do shows how desperate they are, and makes you sympathise with them, and that's even before you learn about their lives in India. Tochi is a man who everyone is prejudiced against because of an old caste system, Avtar is seeking an education and money to help marry the girl he desires and make something of himself, and Randeep seems to have it all but his circumstances mean he has to take responsibility for his family's future. All three men have very different tales, but all are subject to injustice of some kind, and all their stories are equally moving. And all beg the question as to whether these men are migrants, or refugees - there's not a black and white answer. That's not to say that Sahota presents Tochi, Avtar and Randeep only as victims. All three men do unsavoury things or behave selfishly - one particular incident involving Randeep caused me to become angry at him, but Sahota creates such perfectly formed characters that I understood Randeep's state of mind and motivations, and I soon felt my sympathy for him return, although I never forgot what he did. We also see the three men change and grow - it's sometimes difficult to remember that these guys are only just into adulthood, they live such hard lives and have seen so much - and those changes and growth are largely for the better. And then there's Narinder, whose life is completely different from Tochi, Avtar and Randeep's. She grew up in safety and security, with a family who love her in their own way. She is deeply religious, and finds security in her faith. Sahota initially presents her as completely different to the three men, and at times indifferent to them and their way of life. But as we learn more about her, we realise there is something missing in her life too, something she's not even aware of at first. It's that realisation and search that leads her to Randeep, and then Avtar and Tochi. Arguably, it is Narinder who is affected most by her year in Sheffield, losing some things and finding others. She is the character I felt closest to, it's not just her gender that made me sympathise with her, but her search for more and her desire to be better. 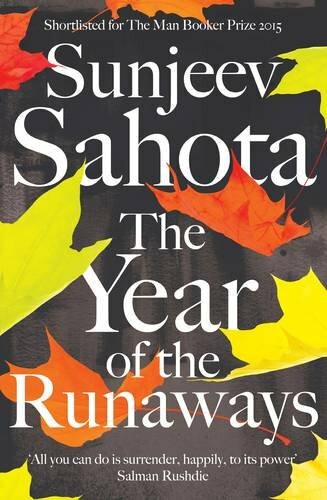 A Year of the Runaways humanises the plight of those living hidden in society, those that we don't notice or choose to ignore, or give labels to that don't encompass their lives and experiences and humanity. It's a moving book, and a story that is told with care. And not only is it a great novel, it's one that teaches us compassion.